Welcome back to Part 2 of Paleo Diet Lifestyle’s Paleo for the Holidays series! 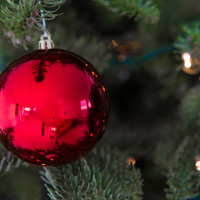 In case you missed it, Part 1 (on avoiding holiday weight gain) was here. This week, we’re tackling all the ways you can celebrate the festive spirit without any food at all. American holiday food culture is a unique form of self-inflicted stress. We all spend most of November and December worrying ourselves sick about the upcoming flurry of unhealthy food. We share tips and tricks for avoiding sugar, tactfully declining fruitcakes, and sticking to our guns in the face of pushy relatives. But each of us behaves as if we were the only person in the whole world who cared about these things! In between shoring up our motivation to avoid the cookies and candy, we’re baking them for everyone else – even though “everyone else” is probably just as stressed out by the junk-fest as we are (even if they don’t let on). Think about it: wouldn’t it be amazing if everyone could realize that everyone else is just as worried about holiday junk food as they are? Wouldn’t it be wonderful if we could all support each other in our diet and health goals, instead of brainstorming ways to “survive” parties and assuming we’ll have to constantly have to be on the defensive? Why should we have all tell each other white lies like “I’ll just take it home for later” (when you’re really going to throw it away or “I already ate” (when you really just want to stop being pressured about the fruitcake)? Couldn’t we all just be a little bit more honest and stress each other out a little bit less? Of course, this isn’t going to happen in the real world, because it only works if everyone decides to do it – which they won’t. But you can create your own glorious little piece of this food-stress-free holiday world, simply by throwing a holiday get-together without any food at all. You’d be surprised at how many people will appreciate this move. After all, Paleo isn’t the only diet that makes holiday eating stressful: anyone trying to take care of their health is probably feeling frazzled and guilty just at the thought of the upcoming “festivities.” Your vegan cousin, your macrobiotic friends, your whole-foods sister, and your calorie-counting aunt are all equally stressed out. Every time they get an invitation to another party full of sugar and candy, there’s that internal battle: should I go and resist the food and feel deprived, go and eat the food and feel guilty, or stay home and feel lonely? Even the people who don’t talk about it openly often feel this way on the inside. By throwing a party that’s not about food, you can let everyone off the hook and free all that energy up for having fun instead of worrying about food all the time. After all, isn’t that supposed to be what holiday celebrations are about? If you’re going to throw this kind of party, it takes a little social maneuvering because food is such a central part of the entertainment at most special occasions. First of all, you’ll need to be very clear about what you’re planning, because otherwise your guests will come with the wrong expectations. Let people know what to expect, so they can count on a stress-free, junk-free option that they can actually enjoy. Ask them not to bring food or alcohol. Remind them to eat beforehand or afterward. If you can find a way to sneak in a second reminder somewhere, it will probably help. If somebody does make a mistake and show up with wine or sugar cookies, don’t get angry at them – you can either just ask them to take it back to their car, or leave it in the kitchen away from the festivities (and then throw it out later, if you like). But don’t let one silly mistake sabotage your plans to enjoy a relaxing and fun occasion. Food often gets used as “something to keep your hands busy.” This makes conversation easier and less awkward. So instead of snacks and drinks, lay out trays of Rubiks cubes, Play-dough, or other little finger toys – it accomplishes the same thing, and it’s a conversation starter, to boot. You’re not being a health nut; you’re being creative! Make water and cups readily available, the same way that you would lay out punch or other unhealthy drinks. Instead of candy for kids, distribute stickers, pencils, erasers, temporary tattoos, packs of crayons, coloring pages, or other non-food treats. Have a plan or some kind of structure for the “main event,” since it won’t be a meal (see below). Now comes the fun part. Without a big meal as the centerpiece of the occasion, you’ll need something else to build your plans around. So check out these 15 ideas for having a joyful celebration, with no food required. There’s a board game for every age, skill level, and time constraint, so this one is perfect for family gatherings where you have to account for both elderly relatives and young children. Settle in for an epic round of Risk with a close circle of friends, get together the word nerds for a Scrabble-off, or hold a checkers tournament with a larger group. If you don’t really play board games and don’t know where to start, there’s an enormous list of popular choices here, which you can sort by age level, number of players, time to play, or overall ranking. Or try asking your guests to bring their own favorites and start up a conversation about how they discovered them. Help an elderly neighbor with grocery shopping – the elderly often struggle to buy and prepare healthy food, so this is a great opportunity to give someone else the opportunity to improve their diet. Rake leaves or shovel snow for people who struggle to do it themselves. Make and deliver gift cards for children in a pediatric ward at your local hospital. Participate in a food drive or a collection effort for gently used winter clothes and boots. Instead of bringing food, have everyone bring a basic wreath or garland and one packet of fun art supplies (mini-ornaments, glittery pipe cleaners, pine cones, fake snow, tiny figurines, strings of cranberries, etc.). When the group gets together, you can share decorations and have fun creating your own holiday décor. Tea is completely acceptable on any diet, and a big mug of something warm and sweet is the best way to perk up a winter afternoon. If each guest brings a box of their favorite seasonal tea, you’ll have quite a selection to explore. Alternately, you could get several sample packs from a specialty store, and take turns trying them out. To make this even better, get each guest a fun mini notepad to record their impressions of each type of tea, so they know which kinds to buy if they love something and want more of it. Hiking isn’t just for the summer: when there’s snow on the ground, you can see animal tracks much more clearly and enjoy a new perspective on a favorite park or nature preserve. Even walking through an ordinary neighborhood can feel magical at night with all the decorations up. A variation on this is all heading out to a tree farm to pick up your Christmas trees together. Kids love this (especially on the farms that let you ride in a horse-drawn wagon out to the actual tree fields), and the resulting tree will make your living room smell beautiful and festive for the rest of the season. Get a group together, and head out to a local rink or pond. Sometimes, you’ll even find special holiday-themed skate nights with lights and carols. It’s a healthy way to get the whole family up and moving, or a romantic way for a couple to spend the evening together. Shovel their walk and driveway. Cook them a week’s worth of healthy freezer meals. Planning this kind of group secret is a lot of fun, and doing something for someone else is a quick way to make you feel awesome about yourself as well. Just make sure that whatever you do, you’re not accidentally creating more work for the recipient. For example, don’t get them something like a puppy, even if you think a puppy might help them feel better, because the inevitable time commitment might just be too much for them. If your extended “tribe” has a lot of pets, get all the humans and the animals together, and go crazy with the dress-up props! Several stores sell pet-sized Santa hats and beards, or elf shoes and other holiday-themed costumes, and if you’re sharing them all around it’s a lot less expensive. Have a contest to see who can get the most ridiculous holiday-themed pet photo (the resulting pictures make great seasonal greeting cards). If you know a knitter or two, ask if they’d be willing to help teach a group. This is a perfect way to involve older relatives who might feel left out or isolated: ask them to be the expert for the day. Or just ask that everyone show up with their own supplies, find a how-to book, and have fun figuring it out on your own. Learning something new together can be a great way to connect with others (it’s one of the reasons why people make such fast friends in college). At the worst, you’ll end up with some strange wooly creations and an amusing memory; at best you’ll figure out the basics of a new and useful skill. The “turkey trot” (a 5k race on Thanksgiving Day) is pretty well known now, but the holiday season is actually full of 5k and 10k races for various charitable causes. If you don’t have one in your area, there’s no reason why you can’t set up your own. Not a runner? Most of them will also let you walk, and the vast majority of holiday-themed events also have some kind of kids’ race with an age-appropriate distance. And while you’re at it, don’t limit yourself to running; why not have a holiday burpee competition? Or a holiday deadlift challenge? Find and photograph the most interesting seasonal decorations in a 1-mile radius. Winner is picked not only for finding the best decorations, but also for taking the most creative picture. Find and photograph all of the following: at least three different reindeer, five different Santas, two elves, and one snow fort (or whatever other items you choose). This can be done individually or in teams. If you want to get really fancy, you could even do a treasure hunt with a series of holiday-themed clues. The possibilities are almost endless, and it’s a wonderful way to get out in the fresh air and notice something about your neighborhood that you never saw before. Yes, the TV is convenient, but there’s something festive and exciting about actually dressing up and going out to watch live actors on a stage. The late-night performances, the bright costumes and stage lights, the shock of the cold air as you pour out of the theater into the crisp winter air: there’s something about being there in person that just isn’t replicated in your own living room. Around Christmastime, popular favorites like the Nutcracker ballet are often on (or if you’re sick and tired of Christmas music, look for something interesting but not seasonal at all). You don’t have to be a musical virtuoso to enjoy singing Christmas carols (especially if you’re in a group!). Some groups go door-to-door in their neighborhood, but another option is to call a local care home or retirement community to see whether the residents would appreciate visits by a group of Christmas carolers. Many people who live in these communities are very lonely and it would make their day to have someone come to visit them – they don’t care that you wouldn’t make it in Carnegie Hall. The holiday season is the one time you get to watch The Muppets Christmas Carol without judgment, so take advantage of it! Or pick whatever other favorite holiday movie you like, and get together your friends and family to cuddle under the blankets and enjoy a relaxing evening in. If you have a local independent cinema nearby, you could also check their showtimes to see if you can catch something on the big screen: often, they’ll offer seasonal classics that you might not have ever seen. You know what’s annoying? Getting all the way up the ladder to remember that you left the wreath at the bottom. Trying to wrestle a Christmas tree into the house by yourself. Detangling endless strings of tinsel while cursing your last-year self for not putting it away properly. You know what’s more fun? Getting together with your friends to tackle each house in turn, as a group, while you chat and have a good time. Set aside a Saturday afternoon, and share your ladders, tools, and helping hands to get everything beautified quickly and painlessly. But What’s Wrong with Just Serving Healthy Food? Nothing. If you’re willing to serve healthy party food – like a veggie platter with homemade dip, hard-boiled eggs, fruit salad, or other Paleo-friendly fare – there’s no reason why you shouldn’t. Don’t do this without warning (serving broccoli when people are expecting cheesecake is a recipe for disappointed guests), but if you want to throw a “healthy food holiday party,” that’s a great alternative as well. In fact, you can even compromise a little by combining healthy food with one of the activities above. Make the main focus of the event something non-edible, and then make sure that the food you do have is something you can eat in good conscience. This takes the pressure off your snack options to be the major source of entertainment, while still providing for guests who might get hungry. Ultimately, of course, the choice of what you want to do at your own party is up to you. But hopefully this list of ideas can at least give you a start in thinking about some ideas to reduce holiday food stress for everyone involved, and actually let you enjoy spending time with people you like instead of having your evening be dominated by thinking about what you will or won’t eat. That’s the idea of a non-food (or a food-light) celebration – and it’s something all your friends will be able to appreciate, Paleo or not.